With a great commitment to quality, Interstates VanLines will help you reduce time, cost and stress of the moving process. As we work hard to keep your personal information safe and secure, you can be sure that you’ll enjoy a fully-trained, licensed and insured team that will deliver the most efficient moving services. With some flexible service options, our company changes the way people move, and makes sure that the quality of the selected service fits both your budget and needs. I want to start my review with saying a big thank you to the Interstates Vanlines team! You are truly the best and I will definitely recommend you to my friends and family. I hate packing! So I ordered full packing service. Guys came on time, I showed them around and they started to pack. People, you will love that! Nothing for you to do! Just sit and watch. They were packing things so carefully, I did not expect that kind of service. at all. I thought that nowadays there is nothing good to expect from the people. Thank you guys again. You are awesome! Moving with Interstates VanLines was such a positive experience. I moved from a small town in Florida to Michigan and i was expecting a stressful moving. But the guys from Interstates VanLines took care of everything. They were friendly and professional. I would definitely use the company’s services again and happily recommend Interstates VanLine to everyone i know. What a stress free and wonderful moving experience we had! My Mom passed and had to move my Dad up north. Robert told me a bunch of lies just to get my money. He gave a price of 2900 which ended up being 5400. Also was told that my Dads things would be in a separate truck. That didn't happen. After the initial payment was taken, I had questions and not one of my phone calls was returned. The packers did not pack everything. Things were left. We were told they did not have enough room. I would never hire or recommend this company to anyone. Unless you call Interstates Vanlines!!! They are the best of the best! A team of highly qualified professionals! I really enjoyed the experience with them! Good job guys! So if you plan a moving, be confident, call Interstates Vanlines!!! You won't regret !!! I recommend Interstates Vanlines! They are the best!!! Our family used Interstates Vanlines for our moving and the guys did a wonderful job. They gave us a service just as they had promised and exactly what we wanted. The movers had packed our things so excellently, also they wrapped everything before putting them into boxes ensure a safe moving. They arranged the boxes on the best way, for keeping our things in perfect condition. I am really satisfied with the way they worked. All of my stuff was in perfect condition at delivery. I recommend Interstate Vanlines to every person who has a moving. I'm really thankful to these highly qualified professionals! They did a spectacular job! I moved from Tampa, FL to Macon, Georgia. I had a lot of things to move, furniture, electronics, and also fragile stuff, but people from Interstate Vanlines packed and delivered my goods in a perfect condition. I've never seen such a perfect moving company! This guys are awesome! They did the job very fast and very attentive. It's the best moving company I've ever seen!!! When i hire interstates Vanlines i did not expect such a good service and to see well trained and professional movers. They worked hard,accurate and nonstop. What a gdeat service. Thank you,Guys. They really helped me to do this hard moving job. I had to move to another state, and I was very busy at that time, but Interstates Vanlines did all hard job for me and they saved me a lot of time. They work really fast and careful. Also I was afraid that some of my furniture could be broken, but the team from Interstates Vanlines packed my stuff perfectly and nothing was broken. I highly recommend you this moving company. They do their job perfectly! Great service!!! Great team!!! Great moving company - Interstates Vanlines!!! Moving is a hard and painful process even with movers. But with Interstates Vanlines and its team, my stuff was wrapped, packed and carried into the truck in 2 hours. Its really fast. The company keeps its word and very honest to each client. Amazing company!!! Everything was done on time and efficiently!!! Very good moving company! Nice and smart workers! Everything went fine, It was the best moving in my life! The movers are so cheerful, even when they carry heavy boxes they still smile and make jokes. I like that in people and they made my spirits rise! They made my moving a perfect one, without stress! Packing was good and delivery was stunningly fast!!! The best moving company to work with!!! I am really satisfied after my moving!!! My son has this good ideea to call Interstates Vanlines, because his friend already hired them. And I'm happy that my son gave me this advice. They are working as they should. Very polite and hard-working people. It'a a pleasure to work with them. They packed the goods and after that delivered them in time. We hadn't any delays. Interstates Vanlines, you are the best!!! Reliable service with on time crew!!! My move was stress free and also peaceful. When I called them support respond us in a quick and mannered way. 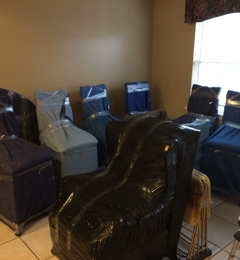 The movers arrived within their time range and were efficient. 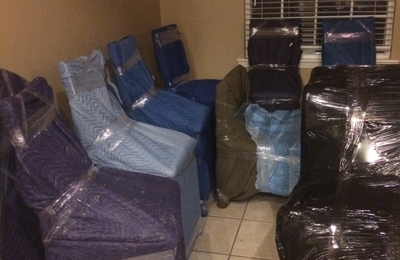 Furniture and other items were well wrapped and handled. I received my belongings less than 48 hours! Excellent Job! Many thanks Interstates Vanlines for your great service and quick response!!! Interstates Vanlines offered outstanding service. They did everything to save our money and provide us a safe and secure move. We found them very careful with our belongings. With Interstates Vanlines my move was completed as a stress less experience. A very good moving company to go with! I am sure I could not get better than this! Thanks again! I am satisfied with their excellent service. I picked them after reading some good reviews on various portals. Communication from the support and work ethics of moving team was appreciable. They handled my goods with proper care. Fragile items were packed and placed perfectly. I will hire them again in near future! Professional, trustworthy and honest. They organized my move very well as i was heard about them. The service was good and my things reach at my place in one piece. On top of it all, they were extremely friendly. When moving in the future I know I will be using them again. Thanks for giving me such a wonderful moving!!! I am happy with my relocation done by Interstates Vanlines! I hired them through one of my friend reference. They have a wonderful team of workers who are quick, fast, efficient. Showed up on time got everything wrapped and packed perfectly. They delivered our stuff prior to said time. The price was fair and reasonable. Thanks very much Interstates Vanlines! They did their job correctly! These guys showed up early on moving day, packed up the furniture, household stuff, different box for fragile stuff. The Manager made sure his team wrapped and placed our stuffs properly. Nothing was broken at delivery. Awesome! I would definitely use their services again as well as recommend them to anyone! I have been treated with great kindness and customer service. I am really impressed by the moving services these guys provided. They were very fast, friendly, efficient, thorough, conscientious, respectful and professional. They delivered everything without any damage. Best movers discovered so far. Thanks for your service Interstates Vanlines! I am really happy with your work and efforts! The easiest move I've ever experienced! Amazing customer support, amazing movers, amazing drivers. The delivery window was very short and all of my items were delivered on the first day. Not one thing was broken. If I ever have another move, I know who to call. I would highly recommend Interstates Vanlines as your relocation company for their reliable service and professionalism!